Our standard website offers a number of options on down sleeping bags: length, width, outer fabric options, zip options, down quality options. 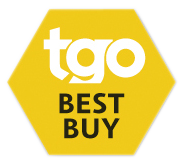 The Great Outdoors Magazine, Best Buy Award. 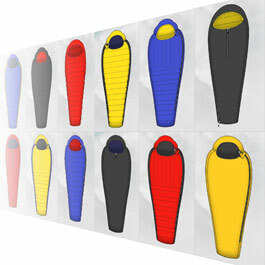 Although this degree of customization is beyond what most manufacturers offer, our Design Your Own Sleeping Bag system takes customization to a whole new level, offering a unique service - described below - with multiple options and BILLIONS of possibilities. We've divided the features you can customize into eighteen categories (see table 1). Some choices are relatively simple: like adding a foot zip so your feet can breathe. Other features are more complex. For instance we allow you to choose not only the quality of the down that goes in your bag (800 or 900 fillpower) but the amount. You can choose as little as 200 grams, or as much as 1300 grams. What's more you can even specify how to want us to distribute the down within the bag: for example more at the foot if you get cold feet. But that's just the beginning. One of the most popular ways to customize our bags is to adjust the length. We offer X-long bags for people up to 7 feet tall (213cm) and X-short bags if you are between 5'1'' and 5''5'' (142-168cm). There are, of course, standard, long and short bags too. You can also adjust the width of our bags to accommodate chests (or waists!) from 36-53 inches (92-135cm). Fantastic ... easy and fun to use ... well-thought out ... the range is enormous ... of value to everyone but particularly those who find standard sleeping bags the wrong shape or size. Our bags are used in a wide variety of situations, and we offer a range of inner and outer fabrics to accommodate. Everything from super lightweight 10X to fully-taped HS2, depending on your preference. You can also specify your choice of colours, both inside and out. 10X–At 26g/sm 10X is PHD’s pick of the new generation of extraordinary ultralight fabrics. Soft feel along with good wear and downproof qualities. 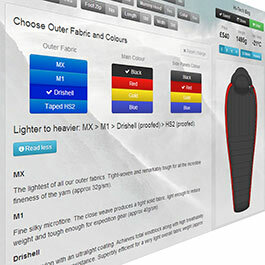 MX–PHD’s extremely light downproof fabric which has given proof of its high performance for several years now. Remarkably tough for yarns as fine as this (approx 32g/sm). M1–Fine silky microfibre. The close weave produces a tight solid fabric, light enough to reduce weight and tough enough for expedition gear (approx 40g/sm). Drishell–Ripstop nylon with an ultralight coating. Achieves total windblock along with high breathability and effective water resistance. Superbly efficient for a very light overall fabric weight. As an inner Drishell can help to protect the down from dampness in difficult situations. But note that it is breathable and therefore will not work as a vapour barrier liner (approx 56 g/sm). HS2–PHD's own highly breathable and fully waterproof outer with taped seams. It is made as a complete extra shell on the bag (approx 88g/sm). For lightweight enthusiasts a zip is often unnecessary extra weight and cost. For most other purposes a zip adds considerable versatility to a bag. Even a short zip allows ventilation in warm weather and makes getting in and out much easier. And full-length zips have the added advantage that bags can be zipped together to make doubles, or completely unzipped to act more like a blanket. We offer short zips, long zips or no zip at all. Zips can be placed on the left, right or centre. We also offer a foot zip option. This lightweight zip is inserted in the side-seam at the foot end of the bag to allow extra ventilation. There is also a specialist zip option available: a short zip with a gusset. This is a fail-safe design used on PHD's Xero expedition bags. The short zip is backed by a down-filled gusset, so that when the zip is opened, the bag expands instead of opening right up. Not good for ventilation, but extra security in extreme situations in case of zip failure. You can opt for double or single draft tubes (the long down-filled sausages behind the zip to keep the cold out). Double draft tubes are more secure when you move around inside the bag and are recommended for serious use, although single tubes are of course lighter. 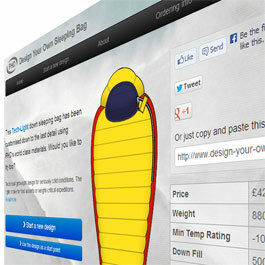 Design Your Own Sleeping Bag now! A mummy hood comes in close and snug around the head, a useful feature at low temperatures. It is standard on all PHD's hi-tech bags, except the lightweight range which have an open hood. You can add a mummy hood to our lightweight bags but if you do you'll also need to choose a zip: otherwise it is impossible to get in and out of the close-fitting opening. A collar, which closes over the shoulders inside the bag and cuts out unwanted drafts, is standard on most PHD bags. The lighter bags in the ultralight range do not have one in the interests of saving weight. You can add a collar to our lightweight bags, using the Design Your Own site. We can add proofed Drishell panels to inside of the hood or foot areas of your customized bag to help keep the down dry. In very cold temperatures your breath can cause ice to form around the face opening, which may soak into the down as it melts. When wet, natural down looses many of its insulating properties so keeping it dry is of paramount importance. On a long trip this can be serious enough that more specialist defenses are needed. But for a shorter duration (e.g. a single ascent), these face panels can make a considerable difference. The panels at the foot are simply to protect the down if you get into your bag with wet socks (or in extreme situations with your boots on). You can choose between stretch and non-stretch hood cord. Non-stretch hood cords are standard on all PHD bags. They are a little easier to draw in and let out than elastic cord. Elastic cord can also function poorly in extreme cold, to which it may be exposed at the edge of the bag. However elastic cord feels a little softer and more friendly around the body than the non-stretch type. On some of our bags you can add side-block baffles. Side block baffles are standard on all PHD bags except the ultralight range. They separate the down in the top (over-body) and base (under-body) of the bag, so that it cannot transfer from one to the other and cause an uneven distribution. In the ultralight range we do not normally put in Side Block Baffles, partly to save weight, and partly so that the user has the possibility of deliberately patting the down around from top to base (if the weather is hot) or from base to top (if it's cold and your ground insulation is very good). For lightly filled bags at moderate temperatures this can be a useful facility, but we do not recommend it on hi-tech bags for use in serious cold. We can add a zipped security pocket to the inside of your bag. Thi is ideal for keeping small items like cameras, batteries, phones and wallets safe. It measures approximately 15 cm x 20 cm. We can overfill your customized down sleeping bag with 100 grams of extra down. This packs the down more tightly without increasing the size of the internal structures of the bag. At PHD we try to optimize the performance of the down in each bag by creating the right space for it to expand fully without becoming too loose. However, some people find that they prefer a more tightly stuffed bag (overfilled). This is not as efficient in warmth-for-weight terms as a bag with standard stuffing, but it does lessen the chance of thinner areas appearing as you move around inside the bag. "Easy, quick, and fun to use . . . very well-designed . . . provides the opportunity for a customized bag that is exactly what you want and which can solve problems of size for those who don't fit off the shelf bags. I think it's excellent." "Down-bag maker PHD . . . will stitch a sleeper to match your idea of the perfect bag for your body and your wilderness sleeping plans." "I just wanted to let you know how pleased I am with my new [Design-your-own] sleeping bag. I used it on the LAMM and I heard lots of people say next morning that they had been cold - and I was snuggly warm. I also had a tiny rucksack compared with my partner - thanks in large part to my ultra light (and gorgeous) sleeping bag."